I planned to write this post months ago, way in advance of our move. When I know I have a lot to say, the thought of starting feels overwhelming. But now the event has happened and it’s time to give everyone an explanation. My husband and I left Buffalo at the end of August and returned to Washington, DC. We lived in DC before we moved to Buffalo four years ago, and it’s where we decided to return. I was really excited to move to Buffalo in 2013. We planned the move for over a year before we actually did it. I armed myself with research, read a ton of articles, and made lists of places I wanted to see and events I wanted to attend. I even started a separate blog dedicated to Buffalo (defunct for several years now). Given all that, I’m sure some people will wonder why we decided to sell our house and leave Buffalo behind. I could revisit the long list of pros and cons we made during our “should we go or should we stay?” conversations, but one factor stood out above all others: Community. We missed our community in DC. We didn’t expect to immediately find the same number of close connections in Buffalo that we had in our former city, but neither did we expect it to be as difficult as it turned out to be. To be fair, we met a lot of very nice people. Some were brand new to both of us and others were friends of Paul’s from his younger years. All of these interactions were enjoyable. The problem was, we never felt like those interactions resulted in close relationships. Many people who live in Buffalo have lived there most or all of their lives. This observation doesn’t apply to every Buffalonian, but in our personal experience, it seemed like most people we met already had enough friends. They were nice to us, and we might hang out once in a while and have a swell time, but with very few exceptions, we weren’t being invited to backyard cookouts or casual dinners. We spent a lot of Saturday nights hanging out with each other because we didn’t really have anyone with whom we felt close enough to extend an invitation. I do place some of the blame on myself, because I’m an introvert and it’s difficult for me to invite someone to hang out if I don’t know them very well. I did extend invitations in Buffalo, though (at least in the beginning, for the first few years when I was trying my best to establish a new group of friends). It’s just hard to keep putting yourself out there when the effort isn’t returned. I went out to lunch several times with two ladies I met through a book club. At one point I suggested another lunch, and over a period of weeks we went back and forth on which date would work. After they rescheduled several times (perfectly understandable), I jokingly said I was stepping back from trying to coordinate the scheduling and they should let me know when a particular date would work for them. The three of us never had lunch again. There are other examples of ladies I met in person after connecting through social media, and I’d see them solo or we’d go on double dates with our husbands. These outings mainly happened during the first two years after we moved to Buffalo when I was making more of an effort to reach out. But again, I felt like those outings happened because I initiated them. I waited for the invitations to be reciprocated, and when they weren’t, I stopped being the initiator. I’m not saying these examples had a direct impact on our departure; our decision to leave Buffalo was wrapped up in many different factors. But this lack of inclusion did contribute to the dearth of community I’ve been talking about. Like I said, there were a few exceptions. I saw Bryana quite a few times, but we drifted apart once her schedule got crazy with work and business school, and then she had a baby last year. And of course there’s Jaclyn, who I’ve mentioned before. I still find it amusing that the closest friend I made in Buffalo was a fellow DC transplant. We’d meet up and moan about our mutual desire to make more friends, but we both found it extremely difficult to establish deeper connections with people who seemed content to keep our friendships superficial. Jaclyn moved back to DC a year before I did, and I encourage you to read this post she wrote about finding her way home again. Another factor in feeling part of a community is proximity to family. We had that in Buffalo with my in-laws, who only lived a mile and a half from us once we moved out of the downtown area and bought our house. 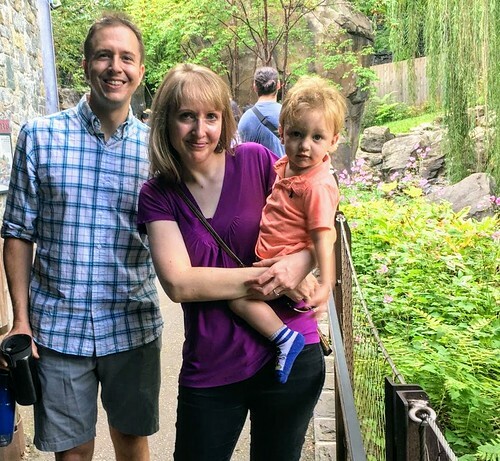 The four of us spent many hours together, and they were the single biggest factor in whether we stayed in Buffalo or not, as Paul and I both knew we’d feel awful about leaving them behind (we knew they assumed we’d moved to the area for the long term). On the flip side, my parents, two brothers, two sisters, two brothers-in-law, and five nephews (plus another baby due in November) all live in Virginia. It takes a few hours to drive from DC to my closest relative, but the option is there and in the past I’d regularly leave the city to visit family on weekends and attend special events. I’m especially close with my sisters and it was tough only seeing them twice a year once we moved away. Before I left DC in 2013, I made a list of pros and cons that is still valid. The funny thing is, I ended up missing the things on the pro-DC list more than I thought I would. It turns out I don’t care so much about the high cost of buying a home in DC now that I’ve been a homeowner in another city and didn’t find it all that great. I’m content being a renter, at least for the foreseeable future. I missed the wealth of public transportation options. In Buffalo, after we bought our house, I started taking the bus to work. While it was convenient, that was mainly because our house was located right off the same main road that my workplace was located on (just five miles north), so I didn’t have any transfers to worry about. What I didn’t like was how bus riding was looked down upon. In smaller cities like Buffalo, the impression seems to be that people only take the bus if they can’t afford to buy a car. It doesn’t compute that maybe I prefer to read a book rather than stare at the road, or that environmental factors play a role, and I was actively doing my part to reduce the impact of driving solo in a car every day. In larger cities, utilizing multiple modes of public transportation is not only accepted, it is commonplace. Environmental factors: I’ve become crunchier in my old(er) age. Two years ago (after we bought our house), I read a book called Green Metropolis and I immediately wanted to sell our house and return to an apartment. The author’s argument (that residents of compact urban centers, especially those who reside in apartment/condo buildings, consume less oil, electricity, and water than Americans who live more spread-out) made sense to me. I try my best to live an environmentally friendly life, and two huge factors are where we choose to live and how often we utilize automobiles. Speaking of the car thing: we still own our ugly car. It’s now 15 years old! We couldn’t bring it with us during the move, but Paul will drive it to DC later this week when he returns from a business trip to Buffalo. I did my best to convince him of the merits of a car-free life (in addition to public transportation, we could utilize a car sharing service like Zipcar, or use Uber or Lyft when we need a vehicle to get around). Our old car doesn’t cost very much to own and operate though, so he prefers to keep it, which I’m fine with for now. We’ll reevaluate our options when this car dies and it’s time to make a decision about replacing it (or not). In the end, our choice to leave Buffalo was never about anything we actively disliked. The city contains numerous amazing destinations and activities; people move there every day and do cool things and start exciting new businesses. I still follow The Buffalo News and read local blogs. I proudly display Buffalo-themed art. I know I’ll return over and over and eagerly seek out what’s new and what’s changed since my last visit. I will always look back fondly on the four years I spent there. The past five weeks since our return have been packed: there have been lots of get-togethers with friends, and a bunch of my Virginia family members drove up to visit over three consecutive weekends in September. I joined a group of eco-minded women and have attended one meeting so far, with more on the agenda. There have been free museums and festivals and wine on our building’s roof deck. My calendar is filling up again and that makes me so happy. I needed to get back to my people. My community. What a beautiful, thoughtful, honest, reflective post this is. I am right there with you, as you know very well! I am very glad that you are HOME again, and glad that our weekends include regular Zan and Paul time once again. Love you! Wonderful post. You really did I think make the most of your experience in Buffalo while you were there. Sounds like you are back where you need to be for now. And totally hear you. Community is everything. Glad you’re back to being surrounded by yours! Lovely essay, and I can relate. My reasons for coming back to NYS from Seattle are pretty much the same as yours for going back to Washington, DC. Well, minus the public transportation, I’m in a phase of life and with family members in rural areas, we’d need a car. But the thing that makes home are the people you feel at home with. Wherever they are, you got to find them, and it’s the best place to be. I’m sorry that we didn’t get a chance to meet while we are here! Having kids has created a social world where most of my connections are my neighbors and people I see very, very easily. I’ll certainly reach out if/when work sends me to DC. I’m happy for you though – there’s really, truly no place like home. I remember painfully feeling this way for, wow, over a decade when I moved to Buffalo. Oh yeah, I’m an extrovert and know everyone and helped to bring bloggers together and had work friends and good friends from college in town, but for some reason it wasn’t my “tribe” I lacked the community aspect. It KILLED me to see my friends who married and started having babies doing all their things together and me being on the outside of all that somehow (I didn’t find Chuck until I was 37!) It killed me to see my friends in Cleveland and DC finding their community and tribe and me visiting them and wishing I had the same thing home in WNY. I can honestly say it wasn’t until I started working at the BPO that this all came together for me. For some magical reason at that exact moment in time, there were a group of co-workers who all were in the same place as me in life and with the same interests and the same living area and we did everything together. NOT UNTIL THAT MOMENT did I end up finding what you are describing. And I went to law school at UB and worked for two organizations (where I met great people!) for 5 years each. Had good friends from college and family in town. And it took 10+ years for me to get to that place. Almost 10 years after that point? I’m desperately trying to make my world smaller…lol. Partly depression. Partly moving 30 minutes south of the city and wanting to hide in the country. And a lot because my day to day professional life is all social. I’m older and grumpy and tired I guess. Selfishly content, though. And in the end, isn’t that what it’s all about? What is best for YOU and your family. Sending long distant, internet friend hugs from Springville. What I’m saying is. GOOD FOR YOU for knowing you have this place and it was in DC. I am loving it! Come visit soon!